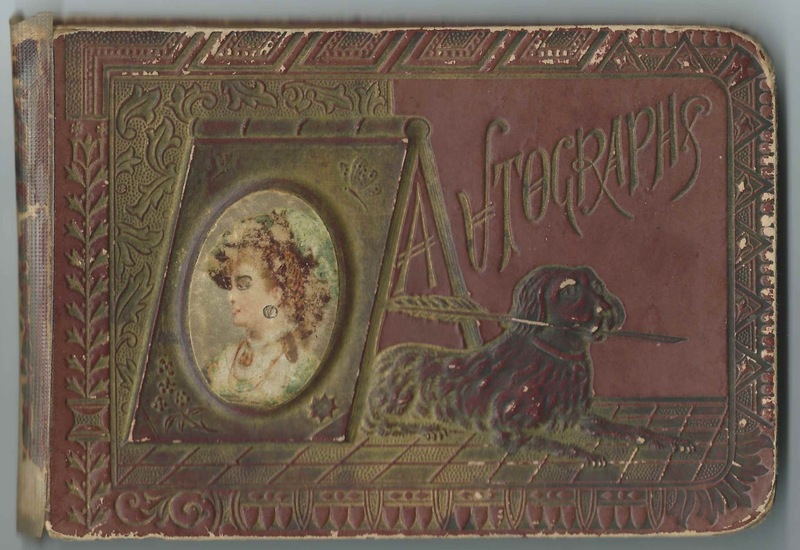 Autograph album given at Christmas 1889 to Grace Etta Charles of Kearsarge, New Hampshire, by her maternal aunt Selma B. (Abbott) Bean. Grace kept up her album until 1916, when, by that time, she had married to Wilmot A. Hibbard and was living at Bridgton, Maine. Grace herself inscribed a page on January 5, 1890. 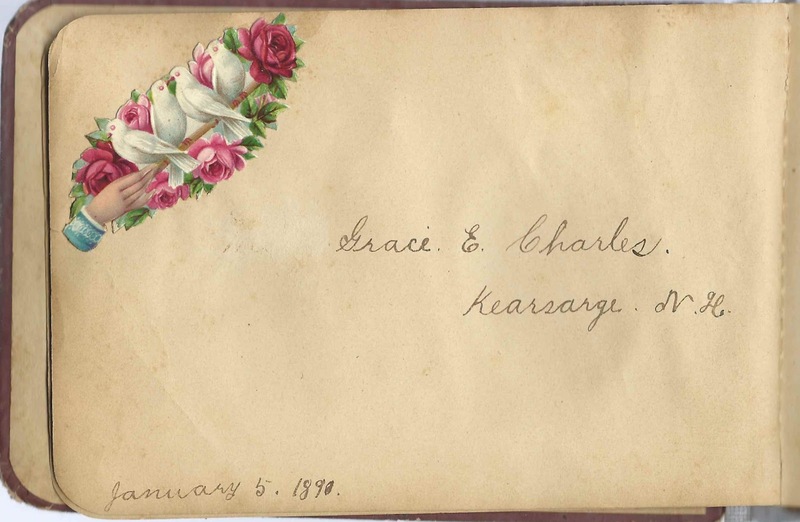 The album measures approximately 7" by 4-3/4" and contains the sentiments of 43 of Grace's relatives and friends. An alphabetical surname list and an alphabetical list of the inscribers, together with any personal information they offered, appear at the end of this post. Grace Etta Charles was born about May 23, 1875 at North Conway, New Hampshire, the daughter of Jason Charles and Vietta A. (Abbott) Charles. Grace's sisters Lizzie B. Charles and Sadie A. Charles inscribed pages in her album. On November 21, 1896 at West Bridgton, Maine, Grace married Wilmot A. Hibbard, son of Orrin Bent Hibbard and Elizabeth Ann (Goldthwaite) Hibbard. Wilmot was born May 19, 1874. An R. I. Hibbard of West Bridgton, Maine, inscribed a page in the album on January 8, 1895. Wilmot had a sister Rebecca I. Hibbard - could Grace's friendship with Rebecca been the reason Grace would meet and marry Wilmot? Grace and Wilmot made their home at Bridgton, Maine, and had at least two children. Grace died in 1930 and Wilmot in 1952. They're buried in the Valley Cemetery at Bridgton, Maine. Aunt Selma gifted the album to Grace Etta Charles at Christmas in 1899 and wrote an inscription on the presentation page. She was Selma B. (Abbott) Bean, Grace's maternal aunt and wife of Horace E. Bean. 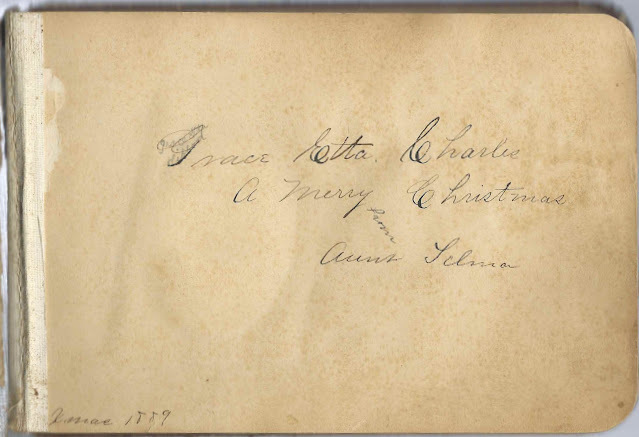 Grace Etta Charles of Kearsarge, New Hampshire, the album owner. Her name was inscribed by her Aunt Selma (Abbott) Bean on the presentation page; Grace also inscribed a page on her own on January 5, 1890. Mrs. Iza Charles of South Chatham, New Hampshire, inscribed on August 12, 1891. She was Iza (Gordon) Charles, wife of Russell J. Charles. Sadie A. Charles of Kearsarge, New Hampshire; inscribed on September 15, 1901. Grace's sister. 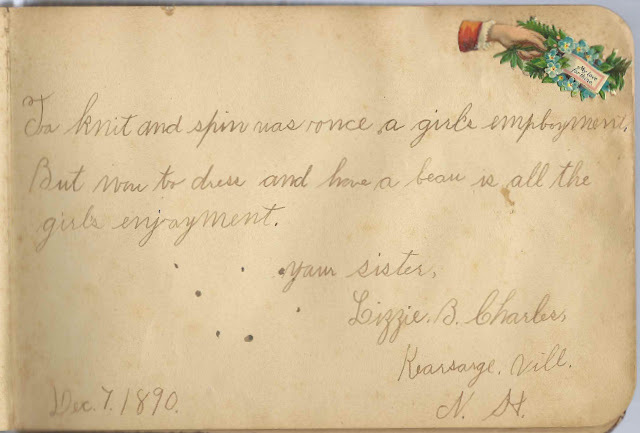 Annie W. Dinsmore of Kearsarge, New Hampshire, inscribed on August 5, age age 11. Annie was born about April 1881, so this inscription must have been written about 1892. Maude Drew of Washington, D.C.
Nettie M. Eldridge of Moultonville, New Hampshire, inscribed on March 1, 1893. Presumably Annette M. (Eastman), "Nettie", wife of Wilbur A. Eldridge, who inscribed the right facing page. W. A. Eldridge of Moultonville, New Hampshire; inscribed on March 1, 1883. 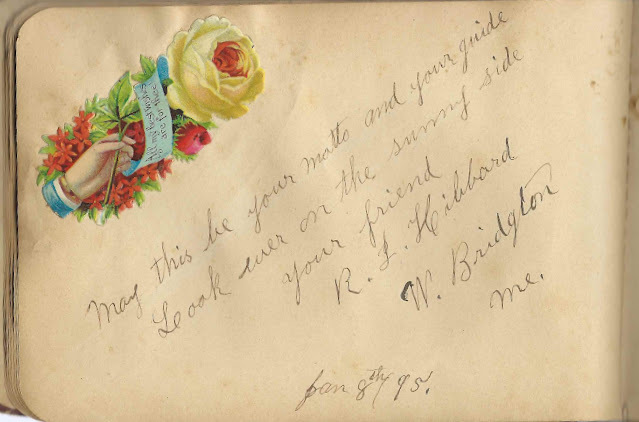 Presumably Wilbur A. Eldridge, whose wife Annette M. (Eastman), "Nettie", inscribed the left facing page. Annie E. Erving of Kearsarge, New Hampshire, inscribed on June 22, 1892. Presumably Annie E. (Leiber) Erving, whose husband Elmer J. Erving inscribed the right facing page. Elmer J. Erving; inscribed on June 21, 1892; sketched a man trying to scale a wall to avoid a biting dog or other creature. 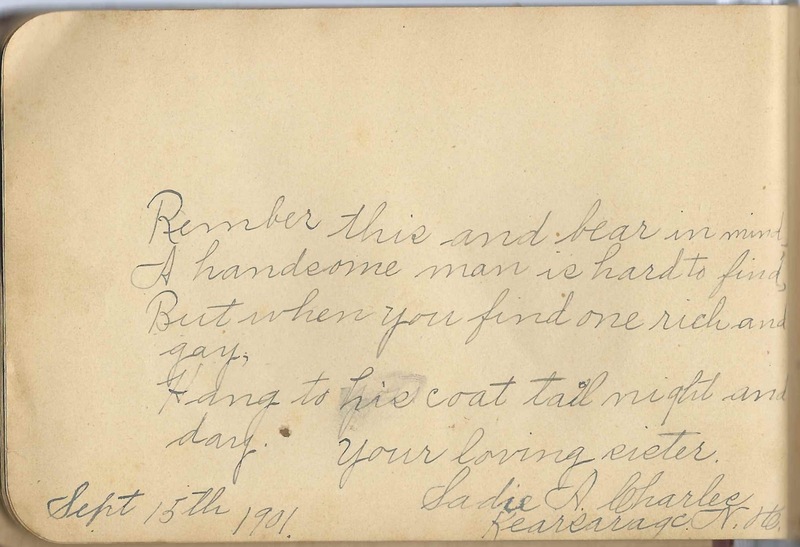 His wife, Annie E. (Leiber) Erving inscribed the left facing page. Katie Fraser; inscribed on March 24, 1894. Not sure of surname. Mildred F. Gibbs of 15 Kenilworth Street, Malden, Massachusetts; inscribed in September 1916. "C.M.O." Ethel Gibbs of Malden, Massachusetts; inscribed on September 1, 1916. Middle initial might be A. for Ethel A. Gibbs. "L.A.W." R. I. Hibbard, or R. I. Hibbard, of West Bridgton, Maine; inscribed on January 8, 1895; possibly Rebecca I. Hibbard. Lubelle B. Patrick of Groveville, Maine, inscribed on August 12, 1891. Groveville is, presumably, the village in Buxton, Maine. Walter H. Peaslee of Oneonta, New York, 54 East Street. Lillian Sanborn of Effingham Falls, New Hampshire; inscribed in 1896. 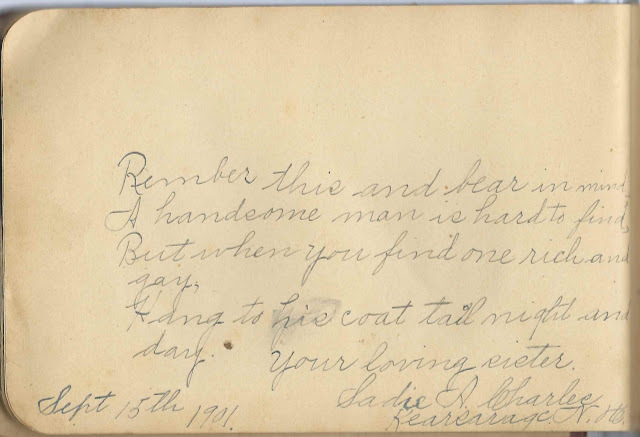 "When I worked at the Ridge"
H. N. Wason, inscribed at Kearsarge, New Hampshire, on September 28, 1891. Could he have been Rev. Hiram Wason (1814-1898)?